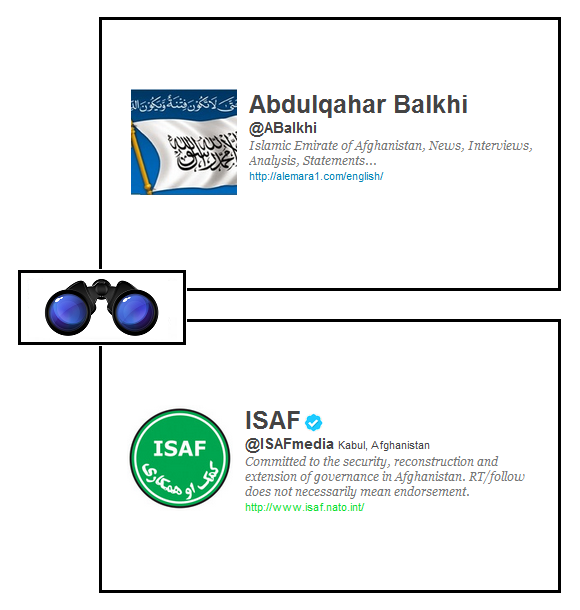 I was writing a post for Zenpundit a day or two ago about two topical interests of mine — religiously sanctioned violence and social media — which came together some while ago when a Taliban spokesperson began using Twitter to make press announcements, and a press officer of the NATO-led International Security Assistance Force (ISAF) began tweeting back. I wandered a bit off topic in the middle of the post to discuss something I might as well call stereo thinking — which is certainly an aspect of Sembl thinking, so I thought it belonged here. Here, then, is an excerpt from that post, with a bit of the original context left in place so that the whole passage hopefully makes sense without requiring further editing. The fusion of the two stereoscopic pictures to a single spatial image is not the outcome of an argument; and if its result is illusory, as it can well be, it will not be shaken by argument. The fusion of the clues to the image on which they bear is not a deduction but an integration. You can find that and much more in his essay The Structure of Consciousness, also found in Polanyi’s book Knowing and Being, pp. 211-13. I don’t think you want to see me attempting to draw an orangutan – but if I was persuaded to try, I’d probably use a technique along the lines of DragonArt’s post on the topic, from which the two illustrations above are drawn. And I was looking for that not only because it’s the solution to a neat creative-thinking puzzle that my father showed me when I was a kid, but also because it’s a graph — and thus a potential board on which Sembl games could be played. In fact I used an analogous device once, during a live intercontinental phone-feed HipBone game, to tilt and transform a 10-position WaterBird board which had already filled with moves into a 12-move board to continue the game, the excitement and the brainstorming just a little longer by popular request..
Back to our orangutan board. Semiotic translation between verbal and visual elements is a fascinating creative challenge in its own right. Indeed, one aspect of what’s up for grabs here is the possibility of an overall semiotics of conceptual mappings — which in turn would facilitate the development of a new style of world mapping, capable of crossing the (leaky) “cartesian divide” between mental and physical realms, while exploring the multiple links and dependencies in our complexly interwoven world. Back to the Sembl games, back to graphs as boards, back to fun. One of the most creative aspects of developing the HipBone and Sembl family of games has been the discovery of potential boards in the most intriguing of places. 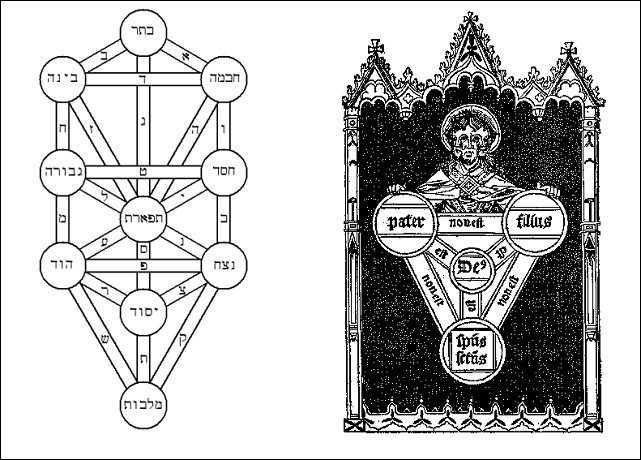 When I was searching for illustrations for my piece on ancient Sembl boards, I was under the impression that Rembrandt had made an illustration of some old sage having a vision of a slightly unusual form of the Sephirotic Tree of Jewish Kabbalah. What the etching exactly represents is unclear. In the early eighteenth century, the print earned the title ‘Dr Faustus’ and in 1791 Goethe used it on the title page for his publication of Faust. However, it is just as possible that this has nothing at all to do with Faust, but is a portrait of a scholar. It may be the ‘practising alchemist’ to which references were made in the seventeenth century. 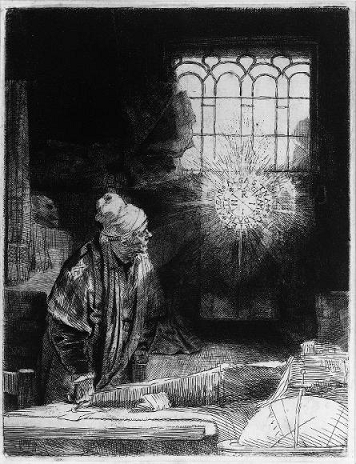 The posture of this ‘Faust’ has much in common with that of a scholar in an earlier print of Rembrandt’s. Rembrandt did not portray alchemists in the traditional way – that is, with fire. The enigmatic text in the radiating light could be a magic spell. So here’s the business my unconscious seems to have had in mind during this whole process of searching in Rembrandt’s works for an image that resembled one of his etchings from around 1652. I was conflating the Rembrandt with the image found on the title page of a book printed in Augsburg in 1516 — and that’s how the creative leap happens, in this case from a 1516 image in Augsburg to a 1652 image in Amsterdam. At the point that I realize this, there’s an aha! 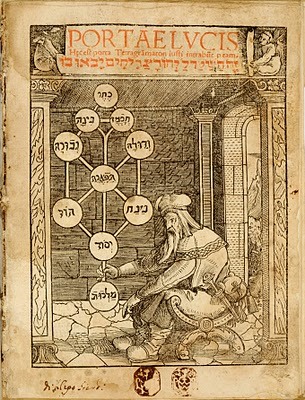 in me, a Sembl move I can make linking the Portae Lucis title page to Rembrandt’s Faust etching – and a vista opening in the realm of art history, in which one could (and perhaps someone should) research the availability of the Ricius translation of Shaarei Orah to Rembrandt himself, and in the rabbinic libraries of his time in Amsterdam. What the etching exactly represents is unclear. I have no idea how original an idea this is, and others may well have considered the possibility and researched the matter before me. I do know that Rembrandt’s Jewish connections have been examined in detail, and would love to have seen the ‘Jewish’ Rembrandt exhibit at the Joods Historisch Museum. But there you have it. The “unconscious” mind finds resemblances and in effect makes leaps, which the “conscious” mind then stumbles across – and on occasion those leaps deserve to be followed up, researched, confirmed or refuted. In this case, I’m hoping my friend Michael Robinson will come to my rescue with some informed commentary – this is in his field, not mine. And INRI, if you think about it, it a sort of Christian variant on the Tetragrammaton: a four-lettered title for Christ. But that would be another possible Sembl move, for another day. Play most assiduously is how Edgar Wind translates the motto of Marsilio Ficino — the man who more or less single-handed, built the Florentine Renaissance: studiossime ludere. Play most studiously. Play as if your life depends on it. Hermann Hesse crowned his life-work with the great, boring, utterly riveting novel Das Glasperlenspiel, The Glass Bead Game, sometimes better known in the English-speaking world by the (Latin) title, Magister Ludi — which means both school-teacher and Master of the Game. 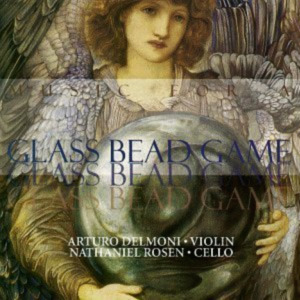 And game there is: the Glass Bead Game itself, or GBG for short. We play, we play games, we play music… we play wargames… all the world’s a stage, and we are (merely) players. Consider: Play is what children do to learn, so brilliantly, language, languages, geography, mathematics, history, chess, go, music, politeness, discipline, excess, consequences, moderation… And play is what masters do to express their mastery — Picasso plays, Casals plays, Einstein plays… And the motto of Ficino, mentor to the Florentine Renaissance, is play most assiduously. How can taking that idea and making it playable not be a worthy challenge, in this world that is daily more absorbed in digital play in its arcades and cinemas, on its consoles, tablets, phones, and computers? Just reading the book made me want to play the game, but I like to keep things simple. I needed to be able to play it with a pencil and paper napkin over a cup of coffee — or on an email list or in the online forums that were beginning to spring up while I was figuring out some early boards and rules. I took Hesse’s basic concept of juxtaposing ideas and applied it on simple graph-like boards, on which each circle represents an idea, and each line a resemblance. I called my playable variants the HipBone Games. More recently, my friend and colleague Cath Styles has been working on the development of iPad and web-playable versions of the games. We call them Sembl, because they explore the resemblances between things, ideas — and at a deeper level, the patterning of the world itself. But the game remains the same: to juxtapose one thing — an idea, an object, a work of art, song, person or event — with another, in a way that generates the aha! of creativity. And to do that repeatedly, weaving an architecture of related ideas, on our way to weaving Hesse’s cathedral of Mind. Our world has never been in greater need of creativity and connectivity — our future depends on them — and in the Sembl game, every move you make is a further link in the pattern that connects, every move you make is a creative leap. More on that in an earlier post, The crackling energy of a Sembl move. I’m always looking around for ways to describe the leap between two ideas (concepts, people, events, things) that occurs when you make a move in a Sembl game. 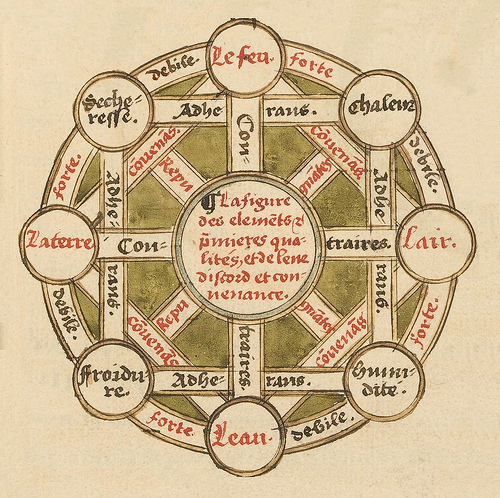 On the game board, the ideas are shown as circles and the links as lines between them. In the case of the museum version, the “ideas” are objects in the Museum’s collection – but the same principle applies whether we’re talking objects, concepts, events or people: entities of whatever type go in the circles, the lines between them signify the exploration of their resemblances and differences. There’s a lot going on here, there’s a distinct leap – think: creative leap, even perhaps leap of faith. It was the leap between two ideas – electricity and magnetism – that gave Faraday his dynamo, Maxwell his equations, and the modern world almost its whole existence. It was the leap between two ideas – modular forms and elliptic equations – that gave Taniyama his conjecture and Wiles his proof of Fermat‘s Last Theorem. The leap that intuits similarities, particularly between rich similarities between rich concepts in widely separated fields, is the most powerful tool of the thinking mind – and playing Sembl amounts to nothing more or less than a repeated, playful, delightful invitation to make leaps of exactly that kind. So a Sembl leap of resemblance can be anything from training wheels for creativity to a prize-winning long-jump at the conceptual Olympics. Which is also why Eliot Eisner, Stanford professor and former President of the American Educational Research Association, said of Sembl’s precursor HipBone Games, “the cognitive processes you are interested in developing are critical to a decent education”. 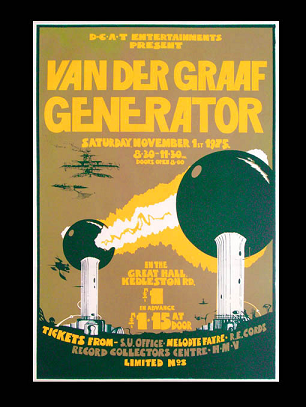 And just what does this have to do with Van der Graaf Generators, you might wonder? Imagine the spheres as two ideas in place on a Sembl game board, and the electrical discharge as the excitement of seeing how they mesh together to create that ah!, aha! or ha! 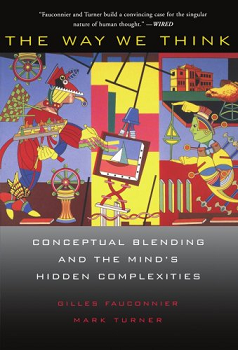 Gilles Fauconnier and Mark Turner‘s The Way We Think: Conceptual Blending and the Mind’s Hidden Complexities gives us a fascinating look at the way the human mind weaves a world out of seemingly disparate elements — in a very similar manner to that in which the creative mind weaves an aha! out of seemingly disparate ideas. The book deals with the formation of perceptions as well as ideas, but it was a specifically conceptual blend that intrigued me the other day. First, they note that when we use expressions like “I had reached the boiling point. I was fuming. He exploded.” we are making a metaphorical mapping in which “a heated container maps to an angry individual, heat maps to anger, smoke and steam (signs of heat) map to signs of anger, explosion maps to uncontrolled rage.” Then they add in the “folk theory of physiological effects of anger” including ” increased body heat, blood pressure, agitation, redness of face” – and thus we have a threefold scheme, in which physiology, emotions and the physics of heat are intricately cross-correlated, so that we can say without much thought “He was so mad I could see smoke coming out of his ears”. In addition to the metaphoric mapping between Heat and Emotions and the vital-relation connection between Emotions and Body, there is a third partial mapping between Heat and Body. In this mapping, steam as vapor that comes from a container connects to perspiration as liquid that comes from a container, the heat of a physical object connects to body heat, and the shaking of the container connects to the body’s trembling. The three partial mappings set the stage for a conventional multiple blend in which the counterparts in the inputs are fused, yielding, for example, a single element that is heat, anger, and body heat and a different single element that is exploding, reaching extreme anger, and beginning to shake. Once we have this blend, we can run it to develop further emergent structure and we can recruit other information to the inputs to facilitate its development. It must always be remembered … that the various senses we take out of an ancient word by analysis existed in it as a unity. 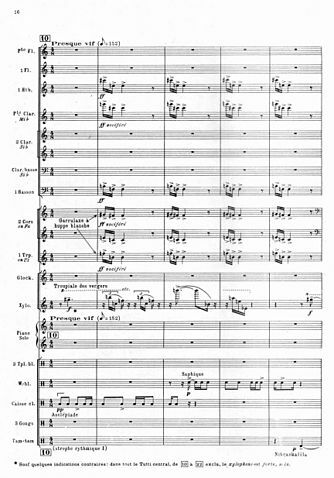 Now consider that Fauconnier and Turner are speaking of how “three partial mappings set the stage for a conventional multiple blend in which the counterparts in the inputs are fused, yielding, for example, a single element that is heat, anger, and body heat” and compare it with Lewis’ “unity” from which we take out “the various senses” by “analysis”, as applied to the “ancient word” pneuma, with its meaning encompassing wind, breath, spirit… inspiration. Are wind, breath and spirit or inspiration in fact three “primitives” that conceptual mapping in ancient Greek thought has brought together? What do we gain, and what do we lose if we view them this way? And what do we lose, what do we gain if we view them as a single rich concept, now reduced to three or four separate — and separately less complexly interesting — ideas? What is the thing that lies behind the semblance of the thing? ‘An axe has split a tree to the core; the core is warm; sound quivers within the bark. “Ah!” cried a woman to her lover, leaning from her window in Venice. “Ah, ah!” she cried, and again she cries “Ah!” She has provided us with a cry. But only a cry. And what is a cry? Then the beetle-shaped men come with their violins; wait; count; nod; down come their bows. And there is ripple and laughter like the dance of olive trees and their myriad- tongued grey leaves when a seafarer, biting a twig between his lips where the many-backed steep hills come down, leaps on shore. ‘ “Like” and “like” and “like” — but what is the thing that lies beneath the semblance of the thing? Now that lightning has gashed the tree and the flowering branch has fallen and Percival, by his death, has made me this gift, let me see the thing. 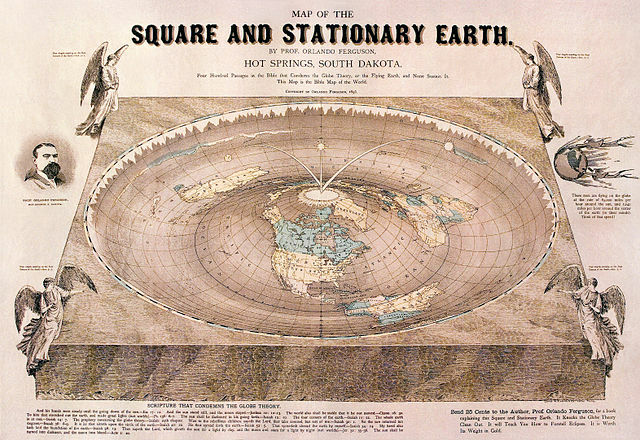 There is a square; there is an oblong. The players take the square and place it upon the oblong. They place it very accurately; they make a perfect dwelling-place. Very little is left outside. The structure is now visible; what is inchoate is here stated; we are not so various or so mean; we have made oblongs and stood them upon squares. This is our triumph; this is our consolation. The sweetness of this content overflowing runs down the walls of my mind, and liberates understanding. — a glimpse of Sembl thinking, with thanks to Derek Robinson. One thing connects with another — one thing resembles another, or is distinctly different from it, or overlaps with it, leads to it, contains it. There are many ways one thing and another can be connected, and people have been playing Sembl-like games, making connections on “boards” much like the Sembl boards that Cath illustrated in her post earlier today, for centuries. In fact, graphical diagrams of linked concepts have long played a significant role at the intersection of art, thought and science. The glorious board above is taken from a manuscript of the De Mundi Sphaera of Oronce Finé (French, 1494 – 1555) at Harvard University’s Houghton Library. It shows how the four “elements” of early science interact, fire being the opposite of water, cold and its opposite, heat, both being able to coexist with either dryness or humidity but not both at once, and so forth. You can see more of Finé’s diagrams here. I’m particularly fond of this particular diagram by Robert Fludd (British, 1574 – 1637), because it shows that the connections can be between (a) objects outside us, brought to our attention by the senses, (b) ideas linking inside the mind to one another, and (c) insights gained by inspiration or vision. The diagram comes from Fludd’s 1619 work Utriusque cosmi maioris scilicet et minoris, and you can find other diagrams of his in a slideshow at this University of Oklahoma site. The good abbot’s diagram shows world history unfolding in three epochs, that of the Father (in Old Testament Times) with its multitude of commandments, that of the Son (from the New Testament to his own day) when only two commandments, to love God and one’s neighbor, were needed — and the gloriously anticipated age of the Spirit, to begin in 1260, in which no commandments would be required since the Spirit would speak in the hearts of humankind. Again, you can see more of his diagrams in this auto-downloading powerpoint presentation from the University of Virginia.